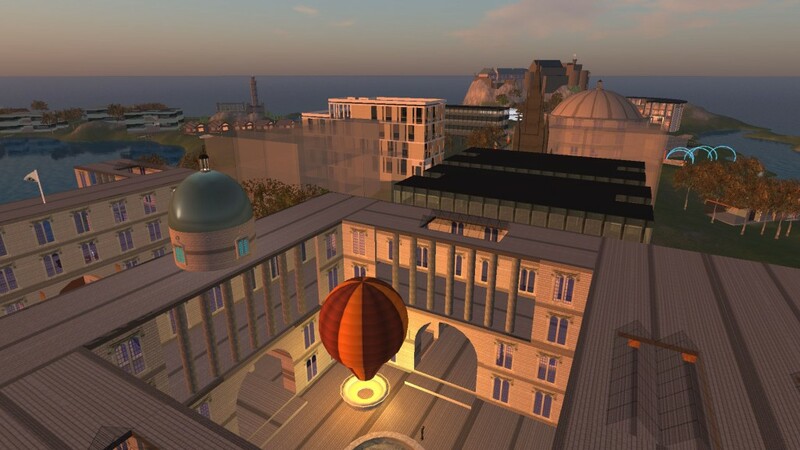 Between June and November 2015 Juliana Lethdetter and Ai Austin exchanged information on the history of the Virtual university of Edinburgh (Vue) group and its use of regions in Second Life from 2007 onwards. Some of the original sketches for the Vue regions in Second Life and a bit of the history of the Virtual University of Edinburgh and its Second Life regions are provided in this blog post. Image below by Julian Lethdetter. 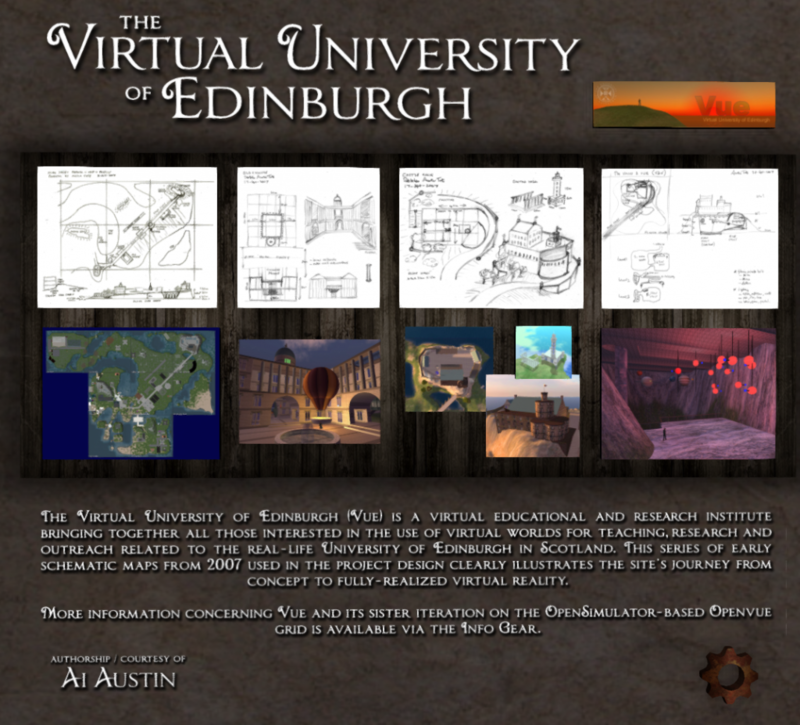 In March 2007, following the efforts of various distinct groups to explore the use of virtual worlds for teaching and research projects, a period of increased publicity highlighting the use of such worlds across Edinburgh University brought together the individuals involved with them to share their experiences with one another. This meeting led to the subsequent foundation of the “Virtual University of Edinburgh” (Vue) group, and their decision to acquire an University of Edinburgh island in Second Life. The Virtual University of Edinburgh started with one region named “Vue” in May 2007. Further school-specific regions, both Homestead and Full, were added around this initial region over the following few months. Later, other shared-use regions (1 full region and 3 homesteads, including a sandbox) were also added, with support from the central University’s Information Services group and the University Development and Alumni group. These central groups wanted one of the core regions to be called “Edinburgh University”, and to have buildings suggestive of the Edinburgh skyline, as seen from real-life University locations. A “Vue Regional Planning Authority” (VRPA) group was formed to coordinate, guide developments and take responsibility for fund-raising for the shared regions. Under the direction of this group, the coastline and topography, including “Arthur’s Seat” hill and “Castle Loch”, were used to create a visually interesting skeleton for the developments, while plots were designed to allow a number of groups and individual projects to be established, and to be changed when necessary. Sketches were made to diagram the proposed inclusion of iconic Edinburgh buildings and features, such as a diagonal “High Street”, with “Old College” at one end and “Castle Rock” at the other, and the presence of “The Vaults” underneath Castle Rock as a large exhibition space. Other iconic Edinburgh skyline features such as “The Bridges”, “Calton Hill Monuments” and the “Scott Monument” were also included. A replica of the Vue environment at its peak land mass of 10 regions currently exists on the Openvue grid (a grid using the open-source “OpenSimulator” platform, which exists separately from the Second Life Main Grid.) This alternate location cannot be accessed from Second Life, but is accessible using an avatar from any “hypergrid” enabled OpenSimulator grid, such as OSGrid. See http://vue.ed.ac.uk/openvue/ for more details. Below is an image taken in 2008 in Second Life looking down “High Street” towards “Castle Rock” showing the full extent of the regions in use then. This version still exists on the OpenSimulator-based Openvue grid. This entry was posted in Edinburgh, OpenSim, Second Life, Virtual World and tagged History, Maps, OpenSim, Second Life, Vue. Bookmark the permalink.